Objective: Hyperlipemia represents an independent risk factor in the development of atherosclerosis in patients undergoing type 2 diabetes mellitus (DM). Moreover, the pharmacological treatment of dyslipemia in patients undergoing type 2 DM (e.g. by means of statins), is accompanied by relevant side effects and oral supplementation with natural antioxidants, such as Citrus polyphenols, has recently been suggested to improve cardioprotection in such patients. However, due to the poor gastrointestinal absorption of polyphenols, novel formulations have recently been developed for getting a better bioavailability of polyphenolic rich fractions of citrus species extract rich in polyphenols. Methods: Here, we investigated the effect of standard bergamot polyphenolic fraction (BPF®) as well as of its phytosomal formulation (BPF Phyto), in patients with type 2 DM and hyperlipemia. A randomized, double blind, placebo-controlled study was carried out in 60 patients suffering from type 2 DM and mixed hyperlipemia. Patients were divided into three groups: one receiving placebo, the second receiving standard BPF and the third BPF Phyto. Results: In the groups receiving BPF and BPF Phyto, a significant reduction of fasting plasma glucose, serum LDL cholesterol and triglycerides accompanied by increased HDL cholesterol was observed. This effect was associated with significant reduction of small dense atherogenic LDL particles, as detected by means of proton NMR Spectroscopy, thus confirming the hypolipemic and hypoglycemic effect of bergamot extract both when using standard formulation as well as BPF Phyto. No differences were seen in the therapeutic response among groups receiving BPF and BPF Phyto, thus suggesting a substantial bioequivalence in their hypoglycemic and hypolipemic profile. However, when comparing the pharmacokinetic profile of naringin (the major component of BPF) and its metabolites, in patients treated with BPF Phyto, an at least 2,5 fold increase in its absorption was found, confirming in human studies the better profile of BPF Phyto compared to standard BPF. 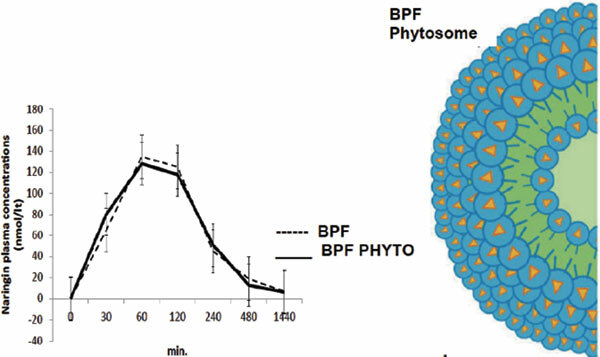 Conclusion: These data suggest that better absorption and tissue distribution of BPF Phyto formulation represents an innovative approach in supplementation treatments of cardiometabolic disorders. Type 2 diabetes mellitus, hyperlipemia, bergamot polyphenolic fraction, BPF Phytosome, bioavailability, flavonoids.